Delfield Equipment is a part of the Manitowoc Group of manufacturers. Delfield has become one of the leaders in commercial refrigeration and the foodservice equipment industry since their founding in 1949. Consider an innovative Delfield model for both reliability and full compliance with NSF. 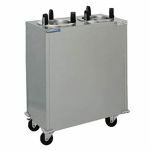 They also can provide custom refrigeration and food prep space fabrication. Delfield 18699BUCMP 99" Undercounter Refrigerator with Three Drawers - 27.31 Cu. Ft.
Delfield GUR27P-S 27" Coolscapes Undercounter Refrigerator with One Door - 6.5 Cu. Ft.
Delfield GUR48P-D 48" Coolscapes Undercounter Refrigerator with Four Drawers - 9.2 Cu. Ft.
Delfield CSR1P-S 27" Coolscapes One Section Solid Door Reach-In Refrigerator - 21 Cu. Ft.
Delfield CSR2P-GL 55" Coolscapes Two Section Sliding Glass Door Reach-In Refrigerator - 46 Cu. 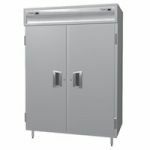 Ft.
Delfield CSR2P-S 55" Coolscapes Two Section Solid Door Reach-In Refrigerator - 46 Cu. Ft.
Delfield CSR3P-S 83" Coolscapes Three Section Solid Door Reach-In Refrigerator - 71 Cu. Ft.